If you are looking for a club in your area you may just find that listing here. CARM is developing a listing to include as many clubs as possible. The clubs will be listed by province or territory first, from Canada since this is CARM, and than by city. After that we will list other clubs by country. For each club we will try to have a couple of images, a description, the club name, location, contact information, dues information and if the club is currently accepting new members. If you want to submit your club to have it added to the listing be sure to fill out the form on this page. Remember the information for your club may not be fully accurate so please contact us with updates or changes. Thanks. Description: ESMRE currently occupies 2,500+ sq. ft. in Sherwood Park. 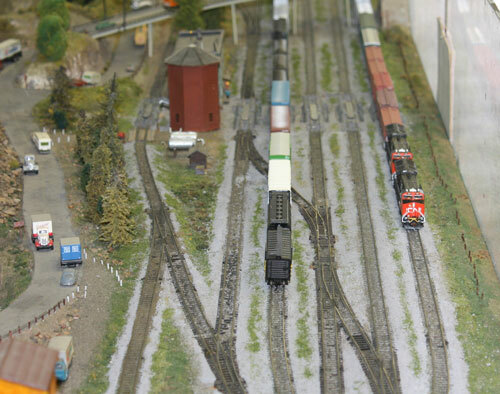 On display are two of largest mobile model railroad layouts in the Northern Alberta area. LaBaJa’s HO scale and Edmonton N Scalers’ N scale layouts are regular annual visitors at the SuperTrain Show in Calgary and the Great Edmonton Train Show. These layouts are consistent award winners at these and other shows such as Portland, Oregon and Saskatoon. Check out the website for more details. Come by for a visit, ask questions or join other enthusiasts in displaying and promoting the hobby. No experience necessary. Description: The H.O.M.E.S. Club was established in 1948. Members meet on Tuesday evenings after 7:00 pm to build and operate a 1500 sq foot transition era model railway, which primarily represents the Toronto Hamilton & Buffalo in south-central Ontario. As mid-20th century prototype modellers, we conduct research to scratch-build authentic scenes, utilize fast clocks, CTC signals, radio communications and Digitrax DCC. JMRI - Operations software controls passenger and freight car switching to replicate the local economy. We welcome new members. Contact the Secretary for more information. See our website and facebook page. Description: The WRMRC is a model railway club located in Maryhill, ON (Region of Waterloo). The club\'s permanent layout is a 2000 square foot, HO-scale miniature recreation of the Canadian Pacific Railway\'s Sudbury Division, as it appeared and operated during the 1970s. Description: Located in Brantford Ontario - we are celebrating our 70th Anniversary this year and invite Carm members and Clubs to arrange/ schedule a visit. We are Canada's 3rd oldest Club established in 1947. We meet every Friday evening and feature prototypical running, including - waybills, DCC, central dispatch and radio communications on our 20 x 40 layout.We are also interested in visits with various Clubs as field trips during our special year. Description: Meets every Wednesday evening -operating the Fenwick Central Railroad. Clubhouse at 1141 Maple Street, Fenwick. We run up to 6 trains on a 25' x 35' layout with a main yard and dispatcher. Computer driven switching program. Era is 1955 to 1965 but usually more modern equipment on show during Open Houses which are in April and November. Video on website as well as directions and dates. 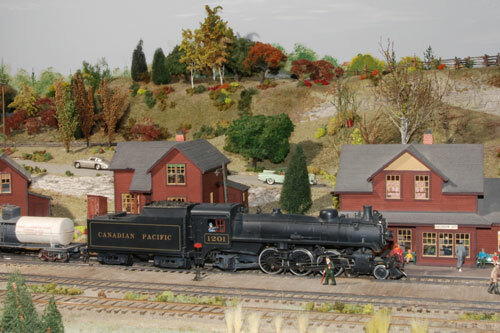 Description: The Burlington Model Railway Club consists of men, women, and families from Burlington and the surrounding area who share the common interest of model railroading, in a variety of scales. Our skill levels vary from beginner to expert. The BMRC was established in the early 1980's as an HO-scale modular club. Currently, BMRC members own and operate model railways in three different scales. We have a large HO-scale layout with both new and established sections, an N-scale layout under active construction, and an outdoor garden railway in G-scale. Many members also have model railroads in their homes or gardens. For further information on divisional meeting days and times please see the contact information below. Description: The Model Railroad Club of Toronto was founded in 1938 by Harry Ebert and Borden Lilley. The Club is O-scale two rail operating prototypically in the transition era of the late 1950's. 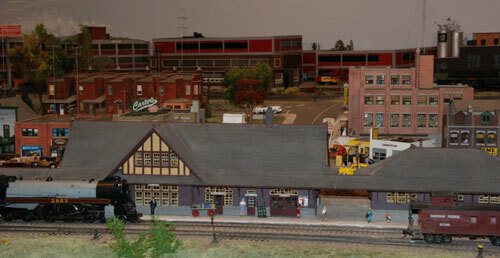 Originally located in Harry Ebert’s basement, the Model Railroad Club of Toronto (MRCT) soon moved to new premises at Toronto’s Union Station. Following World War II, the railways required the Union Station space the Club occupied, so a hunt for a new home was on. In January 1946, the Club moved to its long-time location in the basement of 171 East Liberty Street (formerly 37 Hanna Avenue), a former munitions factory. In April 2013 the Club relocated to 11 Curity Avenue, Toronto. Over the past 80 years a great many have belonged to the Club and enjoyed themselves through fellowship with others that share their passion for the hobby. 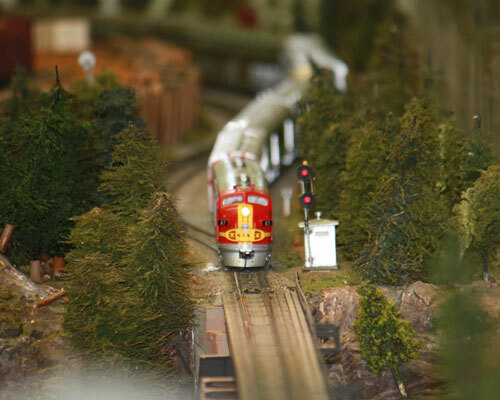 For many, membership at the Model Railroad Club of Toronto has been a lifelong commitment. The MRCT is accepting applications for new members. For further information please see the contact information below. Description: The operation features about 3500 square feet ofmodel railway with comfortable viewing space for 50 or 60 people. Truely a model railway to place on one's "must - see" list, we present a beautifully sceniced rolling Southern Ontario landscape dated July 1954 with several hundred, 100% scratch built buildings, about 40 scratch built passenger cars, plus a dozen hand built locomotives. Our jewwl in the crow is the "Night Scene" where the layout comes alive with hundreds of miniture lights in all the buildings while the day gently fades to night. Picture in your mind passenger trains rolling through the night. See our web site for hours of operation. We are open about 100 days a year, so plan a weekend that fits your travel plans. Description: An afternoon special interest group of Liphook University of the Third Age (Liphook U3A) and Midhurst U3A. U3A is a national & international organisation aimed at the semi-retired and retired, ladies and gentlemen aged 55 years and over. Despite the University title in the UK no formal qualifications are awarded or needed. The Milland Valley Railway Modellers currently meets 9 times a year on the third Wednesday afternoon of every month (no meetings in July, August and December) 14.00 to 16.00 hrs in the Redford Village Hall, Redford, Midhurst GU29 0QF We hope to increase number of members this year. Description: Small friendly club, established in 1964. Meets every Friday evening (except Christmas and New Year) at the Committee Room, Milland Valley Memorial Hall, Iping Road, Milland, Liphook GU30 7NA between 7-30 and 10-30pm which is just over the border into West Sussex approx 3 miles from Liphook, 7 miles from Petersfield, Hampshire is about the same from Midhurst (West Sussex).We are in the South Downs National Park which stretches from Winchester in the West to Eastbourne in the east. Our members come from an area within a 15 mile radius. Club members have a wide range of interests covering British, German, French, Japanese and North American outline, Standard and Narrow gauges Regularly exhibits at local and regional shows. Arranges Model Trains in the Valley its annual club open day in late October which attracts 100 visitors in a 5 hour session In co-operation with the Liphook University of the Third Age (U3A) has arranged a Building a Model Railway Course in 2010, 2012 and in the coming September. Please fill in every field in this form so that we can present your club properly. Form Password: Please enter the password myclub. Send two images by e-mail to webmaster@caorm.org to have these included in your club listing, remember to include your Club name. Images should be JPG file types and no more than 1mb in size.